With the weather above freezing today, I knew it would be a great day to head to the zoo with the kids. Problem is at 12 and 14 they would rather hang out at home playing xbox and watching youtube. I did manage to eventually convince them to go and though they may not admit it, they had as good a time as if they had been 6 and 8. I particularly enjoyed the new Penguin Plunge even though it smelled pretty fishy….The good news about the kids growing up is that they were both okay with going out for lunch and skipping the ‘zoo food’. I remember when they were young trying to hold them off at lunchtime so that we could make it to Spolumbo’s for a later lunch. What is it about kids that makes them insist lunch must be eaten at 12:00 pm sharp? We got to Spolumbo’s at about 1:30 pm, not bad I guess. There was no lineup and a couple of empty tables so I think maybe our timing was perfect. We all had a look at the sandwich board and even though kid number 1 is a big fan of meatball subs, we all opted for a panini. The panini come in two sizes, regular and mini. To compare, I usually finish 3/4 of a foot long sub at Subway. With the ‘regular’ panini I was done and stuffed at about 2/3 way through. 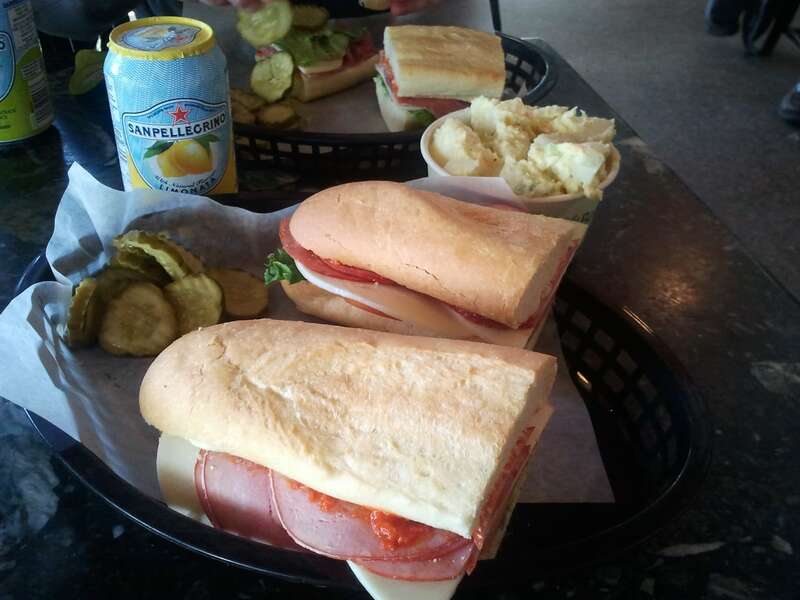 We ended up ordering three paninis; I chose the capocollo, kid number two the mini prosciutto and kid number one eventually settled on the ‘Spolumbo special’ which was meat loaded with capocollo, prosciutto, mortadella, and genoa salami. All three came with veggie spread, provolone cheese, lettuce, tomato and pickles. I also ordered a side of small potato salad because it’s out of this world delicious. As we were waiting for our orders we had a look around at all the sports memorabilia and talked about the restaurant. 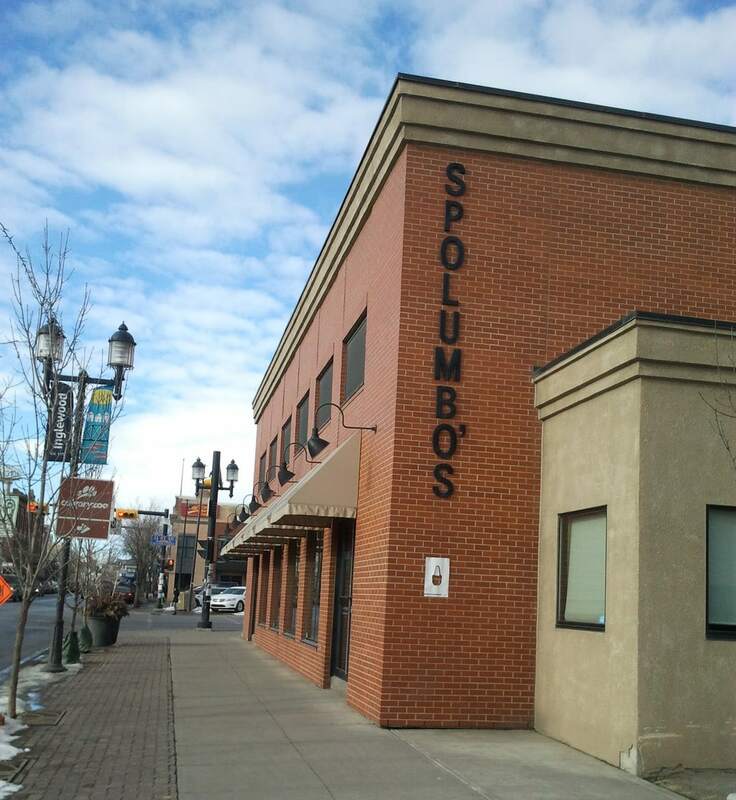 I thought everyone in Calgary knew the story of how Spolumbo’s was created so it was a shock to me as I had not done my due diligence as a parent when I found out that my children were ignorant of the story. Fortunately, I was able to remedy that quickly and now my children know an important Calgary food history story. When we were finished stuffing our faces with Spolumbo’s deliciousness, I waited in the ‘sausage line’ to get us some sausages for the weekend. From my Spolumbo’s experiences of the past I knew I would be there a while and today was no exception. 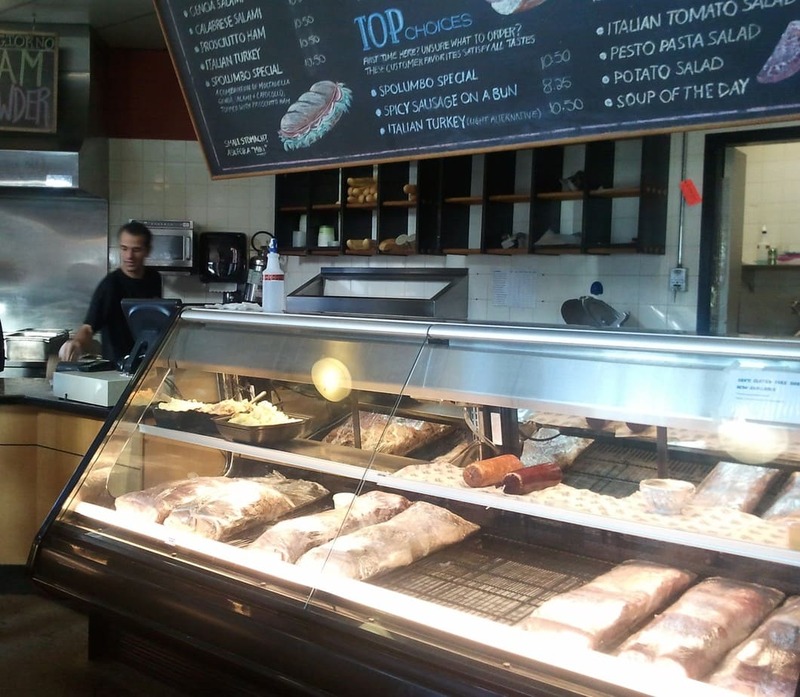 I definitely think this area of the deli could be a bit more efficient. For example, when the employees see that a line is forming or when there are several people waiting for sausages perhaps it would be a good idea to help out the person working in that area. Dealing with the customer, weighing and packaging the sausages takes a lot of time. Especially if that customer wants every type of sausage in the case! I was second in line and I was there for a good 20 minutes. Not really efficient where there were at least 5 people behind the counter and the lunch rush was over. I finally ended up getting the remainder of the fresh bratwursts for ‘lupper’ Saturday and some maple breakfast sausages for Sunday breakfast. 1308 – 9 Avenue S.E.